70cm: A group of 4 homemade 33 element-yagis, each 7.0 meters long designed by DJ9BV in the DUBUS-magazine. The spacing in both directions is 1.90 meters, the feeding is 50 Ohms aircom-cable with N-connectors. The Power-Splitter, Preamp and relay is in the box, which you see in the middle of the dipoles. 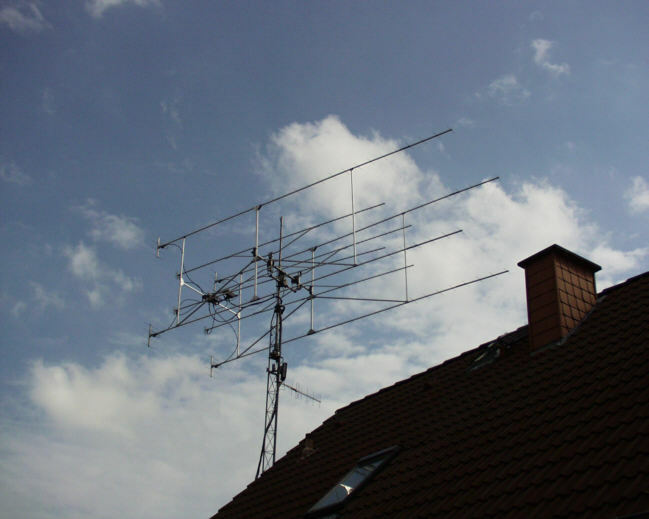 23cm: Here you see the 4x67el by SHF-design, which was used for the EME-random-contacts with TM8EME and OX2K. Normally I only have one 67el on the tower, as it is better for normal tropo-use. Vert.Rotor: KR500A with additional chain-gear (3:1), which gives a maximum elevation of 60 degrees.